These are the doodles of a creative child, made on the backs and in the margins of his schoolwork eight hundred years ago. Onfim was born in the late 12th or early 13th century in the city of Novgorod in northwestern Russia. At the time of Onfim’s birth, Novgorod had been an independent democratic city-state for about a hundred years. The Republic of Novgorod would survive and prosper for several more centuries, growing so much in power, wealth and prestige that its proud residents referred to their city as though it were a person: “His Majesty, Lord Novgorod the Great.” Veliky Novgorod (Great Novgorod) is still the city’s official name in Russia. Lord Novgorod the Great had an unusually high level of literacy for the period, at least partly due to a free and accessible source of paper: the region’s abundant birch trees. Novgorodians used them as living memo pads, peeling off the papery bark and writing messages on it. Called beresty, these birch-bark notes were discarded after use, at which point many would be preserved by the unique mixture of clay and bacteria in the local soil. Since 1950, over 1100 beresty have been discovered in Novgorod, and more get dug up every year. Written in a Slavic vernacular called Old Novgorodian that is distinct from the literary language of the time, beresty offer a glimpse at everyday life in Medieval Russia. They are not political discourses or religious texts but shopping lists, love-notes, invitations, and even children’s drawings. That’s where Onfim comes in. Images of Onfim’s drawings from Wikimedia Commons. He had a family. He drew and labelled his mother and father alongside two children chasing each other around a tree, perhaps himself and a sibling. 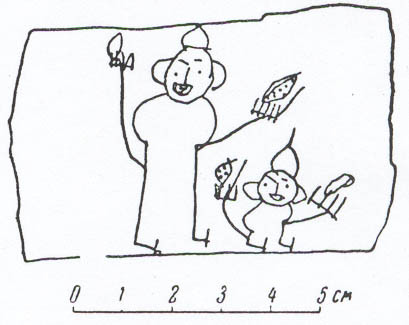 Another drawing of a child next to an adult, both figures dressed for war, may depict Onfim’s fantasy of becoming a warrior like his dad. He had a male friend or sibling named Danilo. 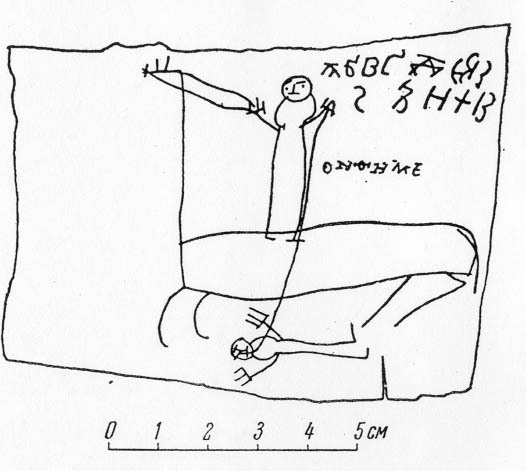 The self-portrait of Onfim as a beast carries a sign in its claws that says Poklon ot Onfima ko Danile, “Greetings from Onfim to Danilo.” It might have been a gift, or even a note passed during class. The earliest Russian cookbook dates to 1547, centuries after Onfim, but we have a general idea of the diet of a Medieval Russian peasant. Onfim’s family dinners would have been hearty, uncomplicated and mostly vegetarian. Cows provided dairy, while foraged berries and mushrooms supplemented home-grown vegetables and grain. Turnip and cabbage were important crops, as was kasha or buckwheat, a botanical weirdo of a plant dubbed a “pseudocereal” because it has grain-like seeds but is not a true grain. Novgorod is a lakeside city, and fish was another important food source, especially on days of religious abstention from meat. The church calendar set the rhythm of Onfim’s diet, with some form of fasting practiced more than 60% of the year. In the Russian Orthodox calendar it’s currently the middle of the Great Lent, the longest and strictest fasting period, when followers abstain totally from animal products, olive oil and wine. Kasha porridge is traditionally seasoned with butter, but I left it unseasoned to reflect the Lenten fast. The Lord is a giant who stands at the edge of the waters, towering over the birch trees. Like the giants in Grandmother’s stories; like Novgorod the Great. He wears a helmet and carries a sword, a real one like Father’s that Onfim is not allowed to touch. Knights and heroes and Father blur together in Onfim’s mind into one figure, larger than life. Today, Onfim used a big stick to draw him in the snow by the lakeshore: the great man, the god-city-father, resplendent in armor. But before he finished, Danilo came and found him, and they broke the stick into two swords and became Ilya Muromets dueling the sorcerer Koschei until it was time for dinner. When Father has finished the prayer, they begin to eat. There are still four weeks of fasting ahead, and Onfim is growing impatient. Curling his fingers into claws under the table, he decides to become an animal to help himself finish the meal. Beasts gobbled their feed and didn’t miss the taste of butter, or caviar, or berries with fresh cream. The steam rising from his porridge mingles with Onfim’s memory of exhaling vapor in the snow. He is awash in the breath of dragons. I am a wild beast, he thinks. He can see it so clearly! He will have to draw it later. Another of Onfim’s self-portraits. He is also known by the Latinized name Anthemius of Novgorod, which makes him sound like a wise philosopher monk instead of a doodling seven year-old. It is interesting to learn what Russian peasants ate — and the drawings are also quite intriguing. Thank you.